Nice index Lars, simple and gets the job done. I’ve tried on and off for a while to run an NGDP forecasting model off only market prices (a VAR) and simulate a ‘historical’ forecast by hiding part of the data set from the parameter estimation. It has so far not given terribly credible historical NGDP expectations, but your index seems pretty good. It would be nice to somehow hook this up to live market prices and have it run in real time off market tick data on a day to day basis. Extracting a synthetic NGDP expectation, from market prices would be highly valuable for research and testing the market monetarist model, me thinks. Lars I like your indicator but you are being unnecessarily indirect. 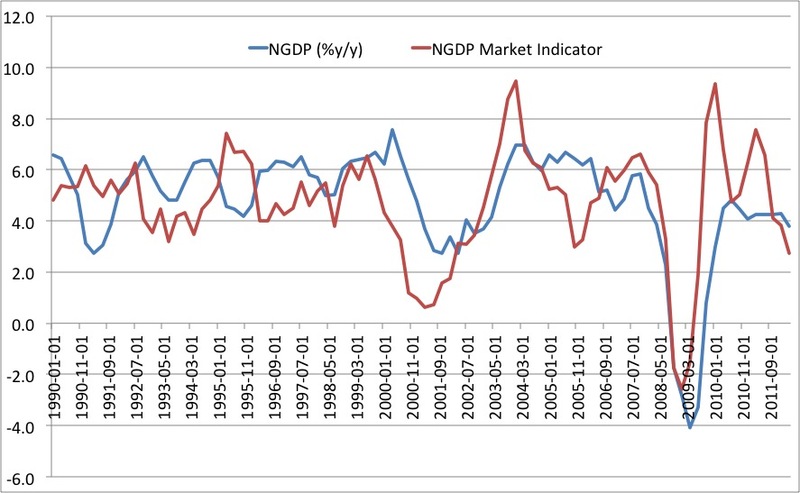 We care about RGDP even more than NGDP, and equity prices signal RGDP directly. What use are our financial commentators on the news if they can’t even explain that stock prices are society’s best estimate of its future real income?